The skin pores get clogged with dirt, oil and dead skin cells. It is very significant to keep the pores clean and dirt free to prevent acne, pimples, blackheads and whiteheads. Regular cleansing and exfoliation of the skin removes dirt, dead skin cells, excessive oil, other impurities and toxins that cause clogged pores. 2. 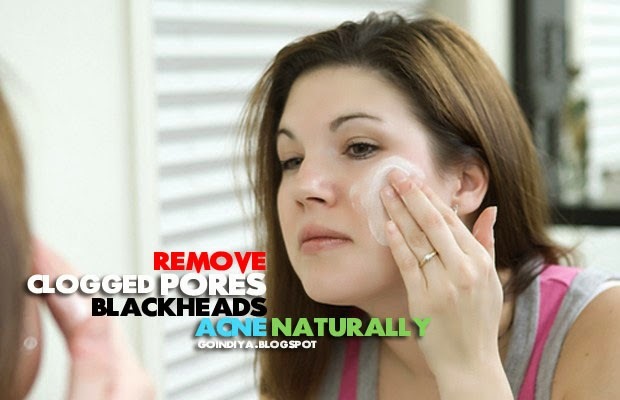 Remove makeup before going bed to prevent blocking of pores. 3. Before going to bed wash your face with lukewarm water to remove makeup cosmetics and then splash cold water to close the skin pores. Steaming helps to open the clogged skin pores blocked with impurities like oil, dirt, it also removes dead cells and other toxins from the pores. Steaming is the primary step to open and cleanse the clogged pores on the forehead, nose, chin etc. Take steam for 5-10 minutes 2-3 times a week. 1. Boil 4-5 glasses of water in the broad pot, cover it with a lid and heat the water until it produces steam. Keep the pot on the ground or table. 2. Add 2 tablespoon of lemon juice to this hot water or crush 10-15 fresh basil/tulsi leaves and add them to the hot water. You can also add 10-15 mint leaves or 1 tablespoon of aloe Vera gel/juice alternatively. 3. Place a towel or big piece of cloth over your head and lean over the pot of hot water. 4. Allow the steam to pass over your face and neck for 5-10 minutes. Do not take very hot steam on the face, as it will burn the skin. Always take warm steam. 5. After that, pat dry your face and apply 1 teaspoon of honey on your face as a natural moisturizer. You can also use your regular/mild moisturizer. 6. Give steam to your face 2-3 times a week to keep your pores clean, unclogged and restore your skin. Caution: Avoid splashing very hot water or very hot vapors, as it is harmful for the skin, it can burn your skin. Lemon contains citric acid, which deeply exfoliates the skin and cleanses dirt, oils that clogs the pores and removes dead skin cells. Lemoncan be very useful in removing dirt, oil from the pores; it can cleanse the clogged pores, also removes blackheads, whiteheads from nose, forehead, chin and chicks. 1. Mix 1 tablespoon of fresh lemon juice with 1 tablespoon of rose water. Apply this mixture to your face and gently rub/massage your face with this mixture using soft brush or fingertips, rinse it off with warm water and apply 1 teaspoon of honey as a moisturizer. Do this for 5 minutes, 2-3 times a week. 2. Add 1 tablespoon of lemon juice to 1 teaspoon of honey, apply the mixture on the face and rub/massage your face gently, especially nose, chin. Forehead etc. for 5-6 minutes. Then wash it off with warm or normal water, pat dry and apply moisturizer. 3. Prepare your own home made natural scrub to clean clogged pores using lemon. Mix 1 tablespoon of fresh lemon juice with less than ½ teaspoon of salt, pinch of turmeric and 1 tablespoon of honey. Mix all the ingredients and apply on the face or affected area. Gently scrub the skin with fingertips for 5-8 minutes. Leave it for more 5-10 minutes and then rinse off with normal water. Repeat this 2-3 times a week. 4. Mix 1 teaspoon of rose water with 10 drops of glycerin and this mixture to your face, the take 2 slices or peels of lemon and start gently rub on affected areas for 5-8 minutes. Rinse off with lukewarm or normal water. Do this 2-3 times a week. Use natural or homemade scrub to exfoliate your skin and for cleaning away the dirt that is locked in your skin pores. You can use few chemical based exfoliation products, which contains benzoyl peroxide, alpha hydroxyl acids, salicylic acid, glycolic acid and natural extracts. These are the finest acids that can remove impurities from clogged pores and removes black heads, but do not use them often. Among these glycolic acid is beneficial for lightening dark spots, scars, black heads, whiteheads and clogged skin pores. Use sugar to exfoliation, it works as a natural exfoliating agent, sugar cleanse clogged pores. Following methods are natural and very effective for cleaning clogged pores naturally; try them 2-3 times a week. 1. Take 2 tablespoon of sugar and crush it into powder, add 1 tablespoon of fresh lemon juice and 1 teaspoon of honey to it. Make thick sugar paste and gently rub this paste on your face in circular motion for 5 minutes to remove blackheads, dirt and excessive oil from pores. Wash off after 10-15 minutes with normal water and apply moisturizer. 2. Mix 2 tablespoon of crushed sugar in 2 tablespoon of fresh tomato juice or paste. Gently rub/massage on the affected area for 5 minutes, then leave it for more 15 minutes, rinse off with normal water. Repeat this 3-4 times a week to clean and prevent pores clogging. 3. Add 2 tablespoon of sugar in 1 tablespoon of gram flour/besan or lentil flour, add 1 tablespoon of fresh lemon juice and 1 tablespoon of rose water. Mix all these ingredients together and make hick paste. Apply this paste on the face and gently rub/massage in circular and upward direction for 5 minutes, then wash it off with water.